In my journey with textiles I have collected a small library of books. Most are the how to type, some are historical references, and some I bought just for the lovely designs. The book I photographed for this post fell into the latter category at first. 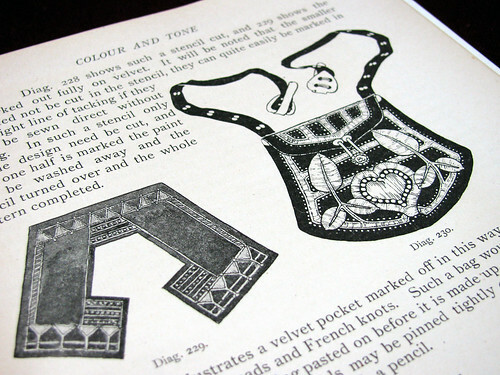 It is “Educational Needlework” by Margret Swansen and Ann MacBeth, published in 1911. I found it in an antique shop in Indianapolis while visiting my in-laws. I loved the Art Nouveau designs. The book is much more interesting than that. It is a book to teach teachers how and when to teach needlework skills to young girls. Everything is laid out by age. The photo is from a lesson for 11-12 year olds. There is a big emphasis on this age as being the time of a “spurt of dexterity in handling material”. It also directs the teacher to seize this opportunity for learning, or it passes for ever. I started sewing and crafting at a young age and often wonder if I would have the same interest or skills if I hadn’t. Needlework was still taught in school in the 1960’s. If only children had more opportunity nowadays to learn this kind of skill that I believe brings comfort for life. Winning at a video game I am sure brings a degree of personal satisfaction. My son thinks of it as the same as my crocheting a doily. I do not, but that will be a question that can only be answered in the years ahead. Now I need to get back to this book. One really funny thing I read was this: “(Patent fasteners form a very popular method of fastening. They are small circular buttons, the convex structure of one fits into the concave of the other very neatly. These are sewn on by strong thread. )” The ( ) are in the text. Well it took me a couple of minutes to visualize what patent fasteners would look like, and I realized they are ‘snaps’. I hadn’t realized before that snaps were not made well or popular until the late 1890’s. “Hear it Snap” was in an advertisement to get ladies to change from using hooks and eyes. The name stuck, thanks Fabrics.net for the history lesson. This entry was posted on Friday, November 14th, 2008 at 3:00 am and is filed under Sewing. Tagged: Book, Needlework, Sewing. You can feed this entry. You can leave a response, or trackback from your own site.